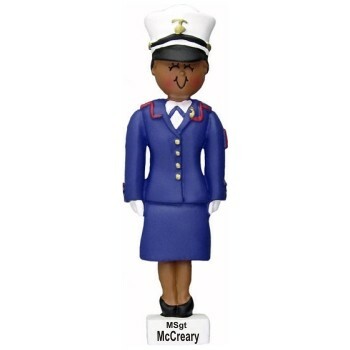 Looking fantastic in uniform and ready to serve her country, the African American female dress blue marine personalized Christmas ornament is a fitting and fun way to honor all the marines on your list. These military ornaments personalized by our lettering pros are available in Caucasian and male styles too. We hand letter the rank and name in black and the optional year in gold. Show your pride and give your encouragement at the holidays or any occasion with the black female dress blues marine Christmas ornament personalized to be a memorable keepsake.